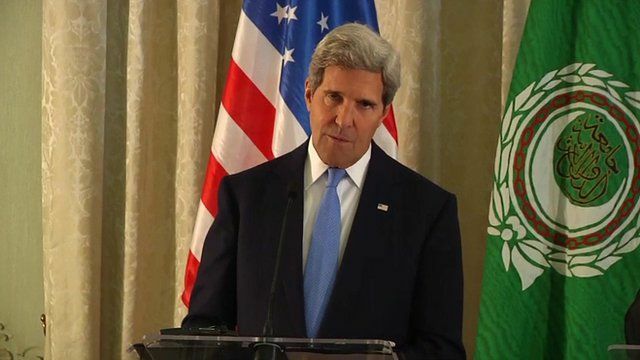 Kerry: 'There is no military solution' Jump to media player The US Secretary of State John Kerry has met foreign ministers of the Arab League in Paris as he continues his tour of Europe to gather support for military intervention in Syria. John Kerry seeks EU support on Syria Jump to media player US Secretary of State John Kerry is in Europe trying to get support for military action against Syria. 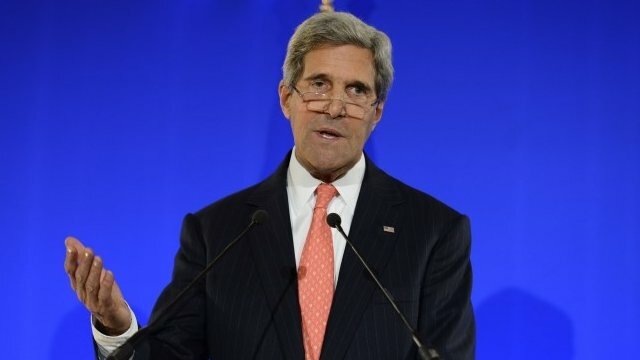 Kerry: 'This is our Munich moment' Jump to media player US Secretary of State John Kerry has described the situation in Syria as "our Munich moment", comparing possible military intervention to World War II. US grateful for some support on Syria Jump to media player US Secretary of State, John Kerry, has welcomed a statement from 11 members of the G20 nations which calls for a "strong international response to a grave violation of the world's rules" - referring to the use of chemical weapons against Syrian civilians on 21 August. 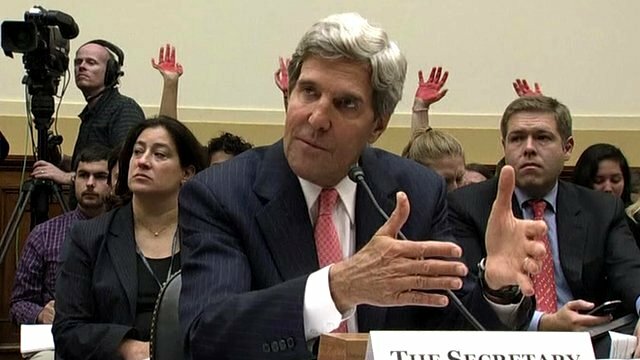 Kerry warns over Syria inaction Jump to media player As a Senate panel approves the use of military force in Syria, US Secretary of State John Kerry tells the House Foreign Affairs committee that the risks of not acting over Syria outweigh the risks of taking action. 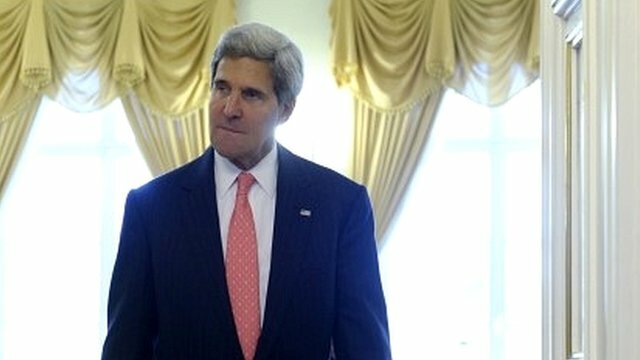 The US Secretary of State John Kerry has met foreign ministers of the Arab League in Paris as he continues his tour of Europe to gather support for military intervention in Syria. Earlier, at a news conference with his French counterpart Laurent Fabius, Mr Kerry said there was growing support for a military strike in response to the use of chemical weapons in Damascus last month. France supports the US on Syria, but like the other members of the European Union, it wants to wait for a report by UN weapons inspectors. 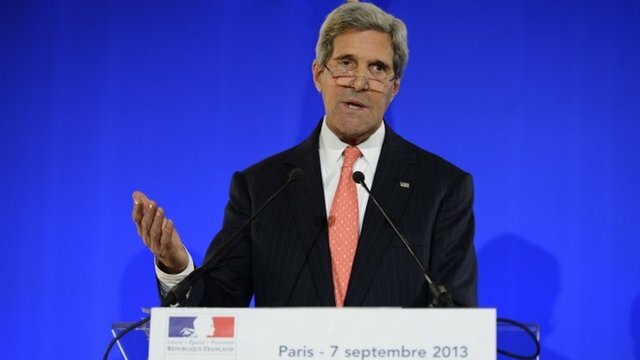 (From Paris Mr Kerry will travel to London where he will meet the Palestinian president.